As part of its week-long centennial celebration that included news about the upcoming release of the S5 Quattro — which might mean something to autophiles, but not much to me — Audi unveiled an updated logo that gave a new shine to the four interlocked rings, from a matte finish to a more chromalicious one, and it switched out the quirky wordmark for a new bespoke corporate typeface. While I would have personally kept the old render of the rings, which look more sophisticated and subtle, I am probably one of the lonely souls to say good riddance to the old wordmark, which I have never liked. Neither letter works well with the other and there is no saving grace for that “d” unless someone were to tell me that it stands for a 6 or 9 and either of those numbers represent the number of pistons, or whatever other engine taxonomic detail, that made the first Audi run. But I doubt it. In exchange, the new Audi wordmark is set in the extended bold weight of Audi Type, a Roman and Extended type family commissioned by MetaDesign from Paul van der Laan and Pieter van Rosmalen. Along with being part of the new logo, Audi Type replaces Audi Sans, a modified version of Univers Extended. Corporate typeface comparison, Audi Sans (above) and Audi Type. Image source. 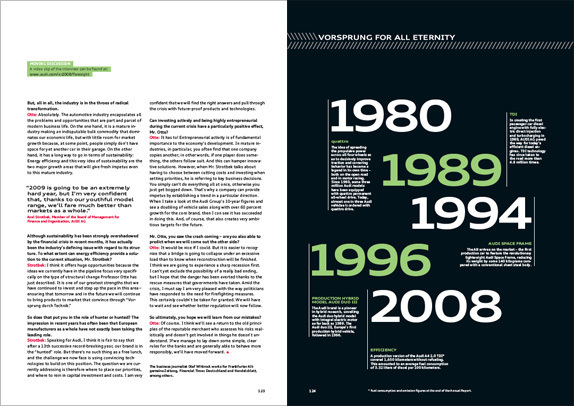 The new type family can be seen in full action in the 2008 Annual Report, available as a PDF. The result is a strikingly modern and contemporary look that blends quite well with the Audi cars, slick and sophisticated. For a few more images and background, please visit FontFeed. 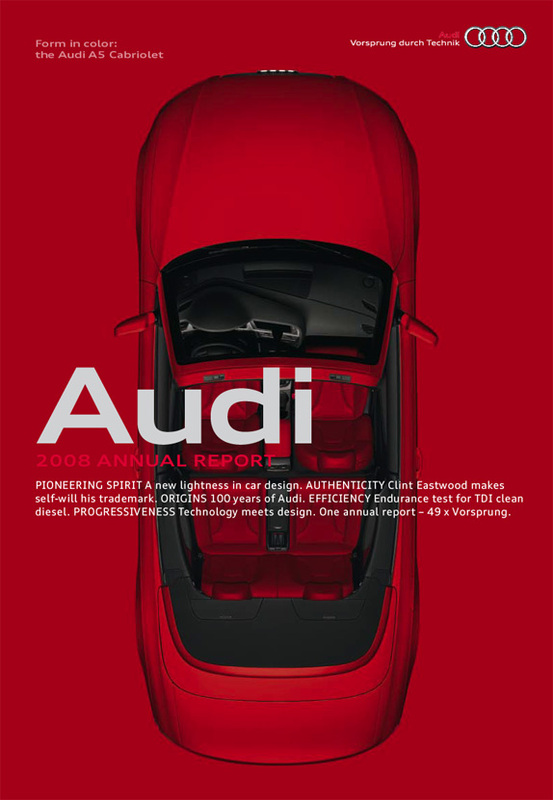 2008 Annual Report cover in red. Two other versions, green and gray, are also available. 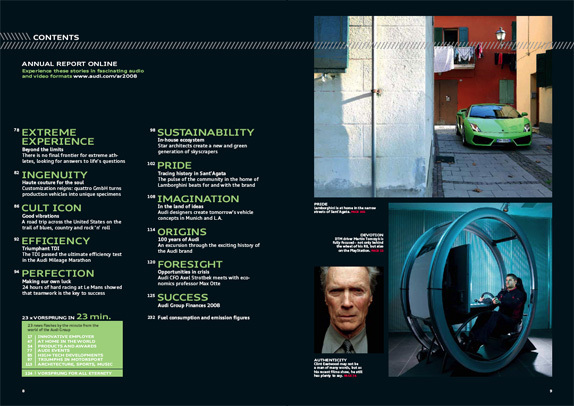 2008 Annual Report sample spreads.